Before humans ventured into space, other animals paved the way first. On 3 November 1957, the first dog was sent into space by the Soviet Union aboard Sputnik 2. Named Laika, she would be followed by several other space canines including the pair Belka and Strelka in August 1960. The United States launched Chimpanzees on rockets in preparation for human flights by astronauts. On 31 January 1961, Ham the chimpanzee was launched in a Mercury capsule aboard a Redstone rocket. Only a few months later, on 5 May 1961, Alan Sheppard became the first American in space on a short 15 minute suborbital flight. The Chimpanzee Enos made a longer orbital flight on 29 November 1961. This flight paved the way for John Glenn to become the first American to orbit the Earth in February 1962. While many people may have heard of these dogs and chimps in space, fewer are probably familiar with the story of the first cat in space. 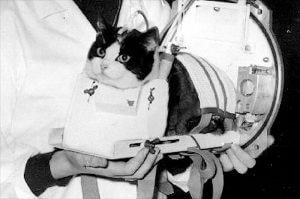 On 18 October 1963, France launched a female cat named Félicette aboard a Veronique AGI sounding rocket from a site in Algeria. The launch was directed by the Centre d’Enseignement et de Recherches de Médecine Aéronautique (CERMA). The mission was a sub-orbital flight lasting 13 minutes and reached a height of 157 kilometers. Félicette was recovered alive after a descent by parachute. She is the only cat to have survived spaceflight. In 2017 a Kickstarter campaign raised funds for a 5-foot-tall bronze statue, to be erected in the cat’s hometown of Paris in tribute to her pioneering space achievement.